Introduction Specifications and FeaturesAnnounced earlier in the year, the K-3 II is the mid-term upgrade to the maker’s top-of-the-line K-3 model which already had impressive specs, including a stabilized 24-Mpix CMOS sensor, 27-point AF system (with 25 of those being horizontal and vertical line-sensitive, cross-type sensors), up to 8.3 fps continuous shooting, and a durable metal body designed for pro use. Although the new model no longer offers a built-in flash, improvements over its predecessor include an upgrade to the stabilized sensor platform.Arguably the most significant upgrade, however, has been the introduction of Pixel Shift technology. 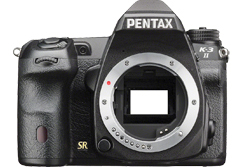 Announced earlier in the year, this model is the upgrade to the Pentax K-3 and features the same chassis and casing, 24-Mpix sensor, 27-point AF system, and high 8.3fps continuous shooting as the original, while adding new Pixel Shift resolution technology and an improved 4.5-stop shake reduction option. Read on to find out how well the sensor in this new upgraded model performs.